In times past, when a large timber of a high appearance grade was desired, a large tree was felled and milled into what was needed. In today’s world, however, such an approach is not often viable. Changing realizations concerning the value of forestland have brought about need for sustainable, responsible forestry practices. In the modern era, oftentimes a prospective builder is faced with an unattractive choice; either use smaller, less impressive beams or settle for less than the desired appearance. The GR Plume Company has perfected a process that eliminates the need for this difficult decision. 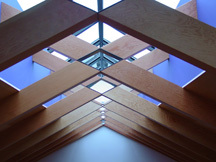 Utilizing several smaller timbers and gluing them into configurations designed for both size and appearance; the resulting structural members can be truly gargantuan in scope while retaining a high standard of beauty. 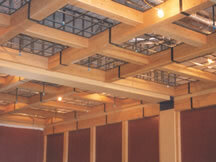 Lamella™ Timbers also retain the grade of their component members. Additionally, when the project calls out for larger timber members, yet requires minimal cracking and checking, we have a developed a process that stabilizes the timber. The larger, fresh sawn green timber is sawn into “laminations” that can be conventionally dried as opposed to radio frequency kiln drying. The laminations are then glued back together to form the same timber (much in the fashion of a Glu-lam except these laminations are from the same timber and kept in sequence). This process allows dimensional lumber to have the stability of seasoned wood without the cracking and twisting endemic to drying large timber members. 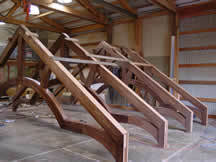 Such a process can also be used to create arches as well as straight beams. 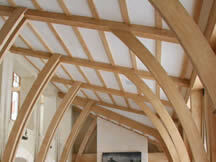 It must be noted that the Lamella™ Timbers are then graded to the same grade as the original piece or pieces of timber. 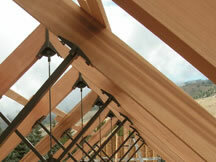 Despite the gluing, a Lamella™ Timber will not carry additional strength and will not be graded as such. It is not considered a Glu-lam, although the gluing process is certified by the APA/EWS, as are all our gluing techniques. Engineered laminate beams (commonly called “Glu-lam”) are an excellent architectural solution to many structural issues; however, their appearance is often less than satisfactory. 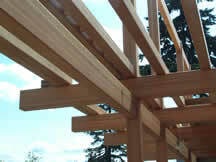 The GR Plume Company offers the best of both worlds; structural members with the strength of traditional glulam but with a much more aesthetically pleasing appearance: our Kalolam™ Custom Crafted Glulam. 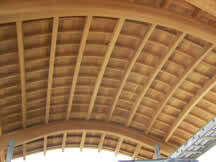 One of the dead giveaways of glulam are the black seams caused by chemical reactions between the wood and the Resorcinol adhesive used in bonding a glulam together. Our glue is a chemically inert polymer that dries to a clear finish, rendering the glue lines all but undetectable after final sanding. Another issue associated with standard engineered beams is the color variation between heartwood and sapwood; heartwood is dark, sapwood is light. When a glulam is assembled without an eye to this difference, the “candy stripe” pattern that results is often visually displeasing. 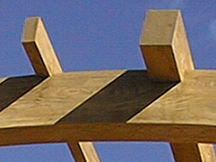 Also, because glulam beams are graded for strength and not appearance, defects such as knots, splits, checking and small tears or dents are within grade but decidedly unattractive. 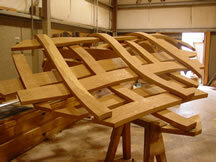 When we manufacture our Kalolam™ Glulams, we hand-sort the lamstock for each structural member, keeping all sapwood away from the edges and face. Even minor color differences are accounted for during this process, and knots are not allowed to cross over between sections of lamstock. Lamstock can be joined together with long scarf joints (in place of the traditional finger-joint), aiding in the color-matching process while retaining the necessary strength. 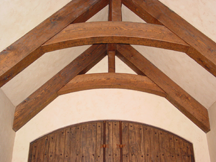 The resulting Kalolam™ beams have both the majestic beauty of heavy timber and the strength associated with engineered wood; all our crafted glulams meet APA/EWS standards for certification. Sustainable FSC certified lamstock can be employed upon request.